This entry was posted in Buddhism, Philosophy and tagged Buddha, dependent-arising, Dharma, paganism, philosophy, Pratītyasamutpāda, Religion and Spirituality, Taoism. Bookmark the permalink. Good to see you blogging interesting things. I think this a very well-written account of naturalism and the ways it links pagan and other traditions to Buddhism – and I thoroughly disagree with it. Let me try to just isolate what I’d see as the key point. If you avoid appeals to God or the transcendent and just appeal to “Nature” instead, all you have really done is relabel the psychological function that belief in God and the transcendent were previously associated with. That function is one of a dogmatic appeal to a belief beyond our experience. We can’t experience God as an infinite or perfect being (only finite experiences that we might label ‘God’) and similarly we can’t experience ‘Nature’ which as a whole is infinite, Protean and vague. Appeals to ‘Nature’ as a whole just function as labels by which we can give try to give dogmatic authority to particular interpretations of it. Naturalists generally like to emphasise the links between justification from experience and their idea of nature, whether this means the evidence of science, or (as you focus more on here) the archetypal or symbolic importance of the concept of nature. But if you want to avoid this just turning into a substitute for belief in God or other absolutes, I think you need to make the distinction very clear between archetypes and metaphysical beliefs. Far from helping either scientific investigation or our relationship to the environment, I think the appeal to ‘Nature’ hijacks the specfic and turns it into dogmatic abstraction. We can understand conditions much better just by investigating and appreciating conditions in their glorious specificity – we do not need an overarching belief in ‘Nature’, which will just distort that appreciation. Well done Dhivan, I enjoyed reading this mini-essay, and feel that a lot more needs to be done in this field. The attempt to embrace Greek philosophy, Norse myth, Spinoza and Buddhism is ambitions to say the least! Technically, of course, Buddhism must be “pagan” in the sense that it is outside the ambit of Judaeio-Christian-Islamic belief – which by definition is the meaning of “pagan”. But such a designation says little, for instance, about Brahmanism which would also have to be classified as “pagan”, of which the Buddha was at great pains to differentiate his teaching. Similarly you do not distinguish between what might be called “philosophical paganism” from the popular beliefs of the time, which should more rightly be termed “superstitious paganism” with its tendency toward fatalism – which I see as the very opposite of the Buddhist emphasis on human freedom. Both Heraclitus and Xenophanes were very critical of the popular cult beliefs of their day. In this vein too, total confusion is added by the evangelist St John, when he throws in his three pence worth by equating this ancient pagan idea of the Logos with the Christian God! (Jn. 1.1-9) All this would have to be unpicked in any thorough examination of a parallel of Logos and Dharma. Unfortunately Robert’s objection fails, as it contains a massive hidden assumption that the only valid source of knowledge is empirical sense-experience. Accordingly, ideas contribute nothing! Such a view was perhaps plausible in Eighteenth Century Humeian Britain, when scientific ideas as independent forces of production were yet to take off. But such a view is completely unacceptable in today’s world. After all, one cannot directly experience atoms, but it would take a very brave person to argue against the reality of atomic weapons! Simply because infinity is, like wise, beyond the threshold of direct human experience, is no argument against the validity of the concept. No, the only argument here is whether the notion of “nature” as an open-ended infinite totality is coherent and rational. I would argue that it is; and hence accessible through a concept. Whereas the notion of the theistic creator God, I would argue, is incoherent: as it contains as an implicit belief in the subsidiary notion that such a God could exists above, beyond, behind, anterior or posterior to the universe itself, and hence such a notion is only accessible through the fancy of the imagination. 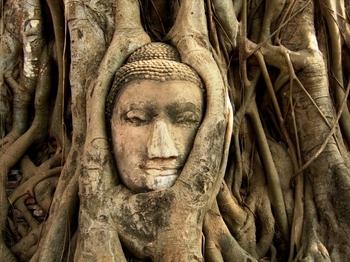 Perhaps more could be made of the hidden assumptions in Buddhism itself. For instance in Spinoza’s “paganism” the infinity of the universe is explicitly stated, whereas in Buddhism it is just as explicitly denied (Malunkiaputta Sutta). But at least in any practical sense the whole soteriology of Buddhism points to the assumption (cheerfully, but unthinkingly, embraced by practicing Buddhists) that the universe is just going to go on and on. But these are really points of departure for future study rather than criticisms of the failings of the essay; and once again my congratulations on your attempt – I hope that we are going to be treated to more installments later on! Hello Robert, always good to have your clearly-articulated perspective. Let me clarify that, contrary to your approach, I am interested in developing a strategical metaphysical vision, based on my sense that this was exactly the Buddha’s intention in teaching dependent-arising. Nature as a whole might be Protean and vague in our experience, but the conceptual abstraction of dependent-arising is a way to organise experience, and pagan images and myths take the process deeper. By characterising this metaphysics as ‘pagan’ and ‘naturalistic’ I want to contrast it with a metaphysics involving a transcendent God or principle. The nature of reality is thus something we can investigate fully in our own experience. For me the appeal to immanent natural order is not primarily for the sake of scientific investigation or for our relationship to the environment but for the sake of establishing a basic platform of ‘right view’ to orient us in life and thought. This of course is highly compatible with both science and a respect for the natural environment. I’d have to disagree with this. What we investigate in our own experience is the nature of experience. What has reality got to do with it, unless one defines reality in such a way as to remove the “real” from it? Well, this is certainly a promising start. I enjoyed reading your first essay and thought you made some interesting points regarding naturalistic and pagan philosophy. I think you’ll find an audience for this kind of writing. My question relates to this statement: “for it is only through the engagement of our entire being through the exercise of imagination that we can bring our rational insights to bear on our understanding of the whole.”. This is simply stated as a fact and not justified. Is it so? Why do you think it is so? Something to explore in further essays? Indeed what is meant by “imagination” in this context? It can easily be associated with “imaginary” for example. I just want to take a moment to give you some kudos. You’ve very nicely put into words an area of contemplation I’ve spent plenty of time in. Well done.